Here's the skinny: I have a thing for horses. They make sense to me. After many years of wishing it were so, I started a small horse training business (it's a "boutique" training business, not because it's super fancy, but because the horses get a lot of personal attention). I take a maximum of 3 outside horses at a time. I have two 3 year old fillies of my own as well and a Spanish Barb. I also go by Dr. Wilber, and teach biology full-time at a community college. 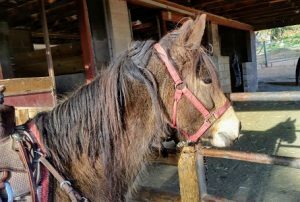 High AF is, as of 4/1/19, a gelding. Judith Huchton and I, who are partners on him, are excited to meet him in person, but for now, as a two year old, he is still enjoying the wide open spaces with Heather McLevin at Thunderstruck Ranch in Alberta, Canada. 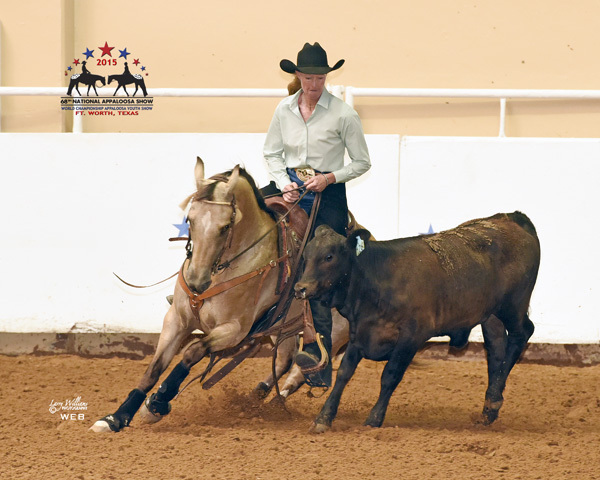 Thunderstuck Ranch was the high point breeder of the 2018 World Appaloosa Show. We have high (hahaha) hopes for him. I plan to go get him from Montana in mid-July. 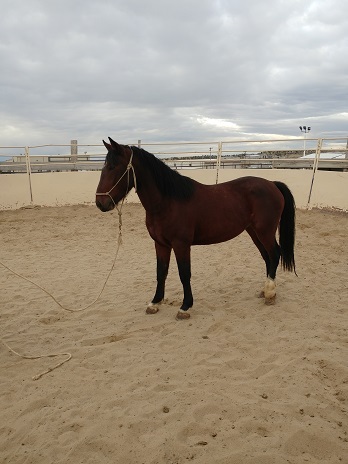 In the video: This was his first day out after being gelded. 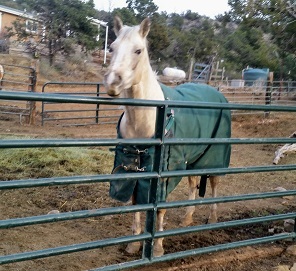 He is the one with the big white Appaloosa blanket! Atti, who belongs to Judith, sprained her front leg almost two weeks ago, and is slated for a few more weeks of rest. It was a relatively minor injury that she got while out playing in the big lot. It is putting a crimp in our show plans, however, and we will miss the May show in Colorado. Also, she had started working cattle like a bit of a cow horse, she can pony the new horses, is great on the trail, and I was even going to let her give a lesson (and she is only four) so, quadruple bummer. We expect a full recovery and hope to to be back in the show ring in June! Atti says: i went down to my birth home for stall rest. i can’t wait to get back to my second home so i can keep everyone on their toes. Me: we miss your pesty self! Lots! I am excited to announce that I will be giving a clinic called Practical Trail June 22 and 23 at the Trout Stalker Ranch in Chama, NM! We will work on horsemanship skills, play in the horse playground, and apply that to actual trails! Here is the link if you want to register. Only $300 for the all inclusive weekend! Slots are limited. We have a cap of 12 riders and it is filling up fast! Penny was the mentor horse. She was a polite and confidence boosting mentor, and did not bring out her Boss Mare persona! I got to be the leader for our 18 rider, 20 equine and one hiker Back Country Horsemen training ride starting at the Golden Open Space and continuing to a stretch of live water in the San Pedro Creek Canyon on BLM land. Running water in NM is a bit of a scarce commodity, so even though this is a small bit, it is still exciting. We had four horses that wanted some practice (well their riders wanted them to have practice), so we sent most of the group on to see a small pond and kept the four, along with me on Penny and Jim on Cometa, at the practice spot. This water was shallow, there was no step down into it, and it was not especially muddy, so it was an ideal spot for Water Crossing 101. First. The riders asked their horses to cross by following Penny and Cometa. Two of the four in our “needs practice” group, hesitated then went across at their rider’s request. They came back and then I had them walk up and down the creek bed until they were comfortable. Bruce’s beautiful Arabian picked his feet up extra high for a good 50 yards before he got used to the feel of the water on his legs and Ginny’s Fresian seemed to take it all in stride right away! There are a lot of busy horses in this world and a boatload of products that claim to have calming effects. We have looked at equine appeasing hormone (EAP), tryptophan, magnesium and fat. So far, tryptophan had no supporting evidence for calming effects, fat had one old study supporting its effects in horses, EAP had one small study supporting its effects in horses and Mg had lots of research supporting its overall importance to living organisms, but only one that I could access supporting its calming effects in horses. Effie, who I started back in 2015, is here for a tune up. She says a great calming agent is age and wet saddle blankets, and truth is, she should know. This week, I am going to look at vitamin B. As I was looking up material for the magnesium blog, I came across several articles suggesting that increasing fat in the diet of horses could result in a calmer horse. I guess I should not be suprised by what I found when I started to look for evidence to support that idea. Yep. The usual. A paucity of actual research. Here are a few quotes from articles I looked at. No actual research data was provided. No research was cited in this article, either. And they threw in beet pulp as a calmer. That was the first time I had seen that. By Awesome Guest Blogger Phoebe Bechtolt. Patty Wilber and Doranna Durgin put their two cents in here, there, and everywhere. In many western states there are still wild, free roaming horses. Managing the needs of horses in conjunction with the needs of the land is not always easy or simple. JMHA’s vision statement is “Connecting Mustangs With Humans”. I looked at Equine Appeasing Pheromone (some data-driven evidence supports its efficacy) and tryptophan (no data-driven evidence supports it) as calming agents in horses over the last two weeks. One of my favorite pictures of LT. Magnesium supplementation did not seem to change her outlook on life, but Vitamin B and tryptophan pastes did. This week is magnesium, and still to come are fat and Vitamin B. Oh boy! When looking into magnesium as a calmer in horses, I figured it would be super easy. There are tons of supplements with Mg in them, and the sellers make a lot of “backed by science” claims, so my plan was to go read those studies, summarize them and ta da! Done! Last week I talked about Equine Appeasing Hormone as a calming agent and this week is tryptophan. Perhaps these seem like rather obscure items to use to calm horses (and there are a few more for the next couple of blogs), but I am focussing on substances that are not illegal to have on board a show horse. When looking up equine calmers, the product will often say “will not test” indicating that if one’s horse were tested for illegal drugs, this supplement would not result in disqualification. The term “pheromone” was “first coined by Karlson and M. Luscher in 1959. Early work was in insects, but scientists soon discovered that pheromones operate in other animals, including mammals.” The Pheromone Site at Texas Tech University. “Appeasing pheromones” are produced by glands in the breast of mammals and the chemical structure of appeasing pheromones doesn’t vary much between species. They are detected by receptors in the nose. Equine Appeasing Pheromone (EAP) is, of course, produced by mares. When foals nurse, they become calmer and feel safer. This pheromone has been replicated and is marketed as Confidence EQ as a calming agent. I have tried Confidence EQ, and I saw a difference in Atti. But, my experience with one horse, is not a scientific study. It is an anecdote. I wanted to find out if there were good controlled studies documenting the effectiveness of EAP. 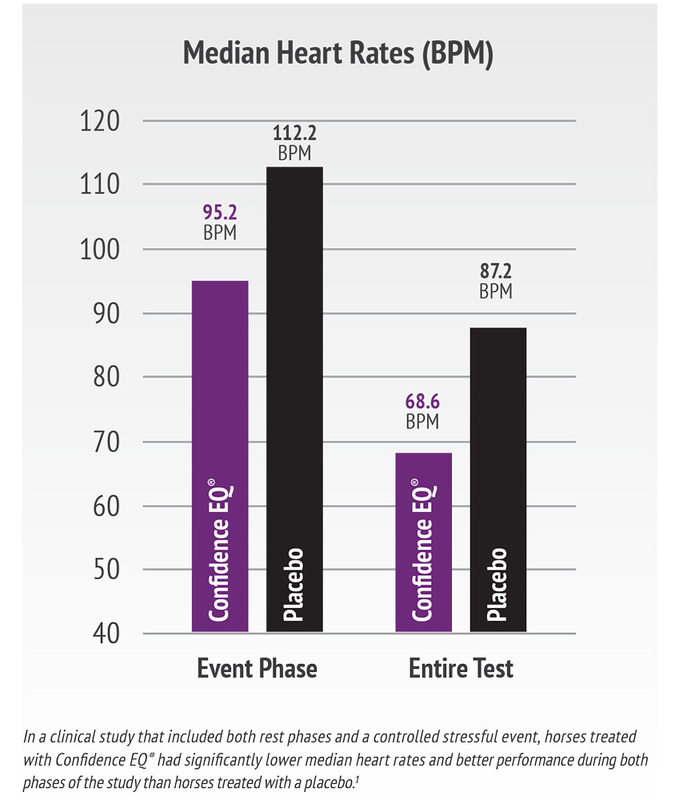 The Confidence EQ website provides a nice graph, but does not state the source of the graph. I have my own arena and round pen (with good footing, even in bad weather), but it is nice to visit other facilities for a change of pace and to see how the horses handle new environments. Public arenas: There are two nice outdoor arenas and a really fancy indoor arena that are nearby. 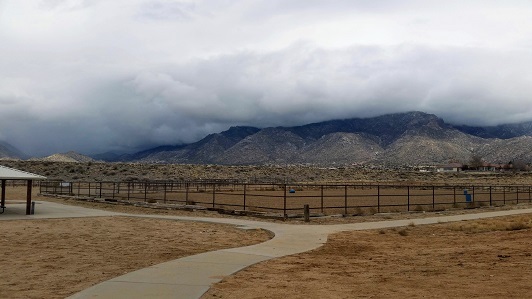 The big fenced arena at Sandia Vista Equestrian Park, looking NE, toward Sandia Peak, covered in clouds. Today my friend Mary Ann Shinnick has a blog for us. Doranna and Patty have generously allowed me to do a “guest blog” this week. I am Mary Ann Shinnick and have been active in horse rescue at Walkin N Circles Ranch since 2011. As a Board member, I help coordinate our equine acquisitions through the New Mexico Livestock Board and often with owners who need to surrender their own horses for a variety of reasons. I became aware of the current plight of the Placitas horses through an email sent to WNCR by the advocacy group “Placitas Wild”. This is a 501C3 organization which was formed to tackle the ongoing issue of what to do about the Placitas wild horses. They are supported entirely by donations. Where in the state can 71 horses be re-settled? That’s the question that has members of Placitas Wild losing sleep. They are beating the bushes to find safe places to move them to. Their deadline was February 18, but the Pueblo of San Felipe has granted them an extension until March 18.